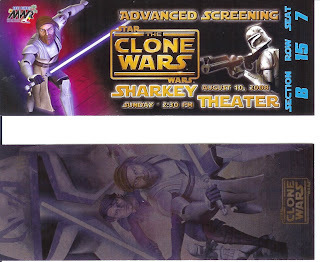 Clone Wars at the Sharkey Theater. 98 minutes of rompin', stompin', shootin', flyin', light-saberin', back-flippin', usin'-the-force, inter-galactic battlin' action. The droid robot soldiers provide a good amount of comic-relief, too. My 7 and 4 year old boys were mezmerized. They made it through the entire movie without any trips to the LBR (little boys' room). The three of us left the theater humming the Star Wars theme song and quoting the one-liners from the droid soldiers. It was no more violent than any of the previous Star Wars movies. There's no real gore. When guys get shot, they fall to the ground just like in Star Wars IV. I actually felt better about my boys watching this than I would about them watching Star Wars Episode III (which I still haven't let them watch). Here's some gouge for anyone considering a future sneak preview at Sharkey Theater. The show was FREE for the first 450 people to show up. There were a LOT of people there, but the theater was by no means full. The employees were commenting how surprised they were that they didn't fill the house and have to turn anyone away - they expected a bigger turnout. Our neighbors suggested going 2 hours ahead of time to get tickets. I didn't know if I could go THAT early. The show was at 2:30, and LW was going to a baby-shower at 12:30, so we dropped LW off, then grabbed some lunch at Subway and went to get in line. I thought we were going to be sitting in line in front of the theater for two hours and came prepared with our lunch and some kids' books and their Leapsters. It turns out I was over-prepared. We arrived at the theater at 1:15 and there were probably 50 people in line in front of us. I never had a chance to sit down to eat our lunch though because the line moved really quick. The ticket window was open and they were handing out the tickets as people walked up. We made it through the line and had tickets in hand by about 1:30. The tickets looked pretty schnazzy - you'd think they were intended as a collectors item. After you get your tickets, you have to enter through the side door up at the front of the theater. Normally, the movies at Sharkey Theater are open seating, so you want to get in there early to get good seats. For this sneak preview though, the tickets had assigned seats, so there was no hurry. Getting in line at 1:15, we got tickets for seats in Row 15. We had to be in our seats by 2:15, so I took the boys across the street to eat our lunch on the Lockwood Hall Lanai, let the boys run around a bit and use the restroom. They would allow each person with a military ID to get up to 6 tickets. You did NOT have to have all six people there when you picked up the tickets at the window. They just all have to be there before you can enter the theater. So you could totally send someone ahead to wait in line and get the tickets and have the rest of your family meet you there to go into the theater just before the show. They had a big sign there saying that Warner Brothers prohibited any cell phones or other recording devices in the theater for the sneak preview, and anyone caught with one would be expelled from the theater. Overall, it was a very good time and I would totally do it again.